What is the RADIUS authentication? RADIUS (Remote Authentication Dial-In User Service) is a client-server protocol used primarily for authentication and authorization of users during dial-up connections in corporate networks. Password Safe can also benefit from the advantages of a RADIUS server. In particular, multi-factor authentication should be mentioned here. But all other RADIUS-typical functions can also be used. Further information can be found for example at Wikipedia. A RADIUS server must be available and accessible via the network. 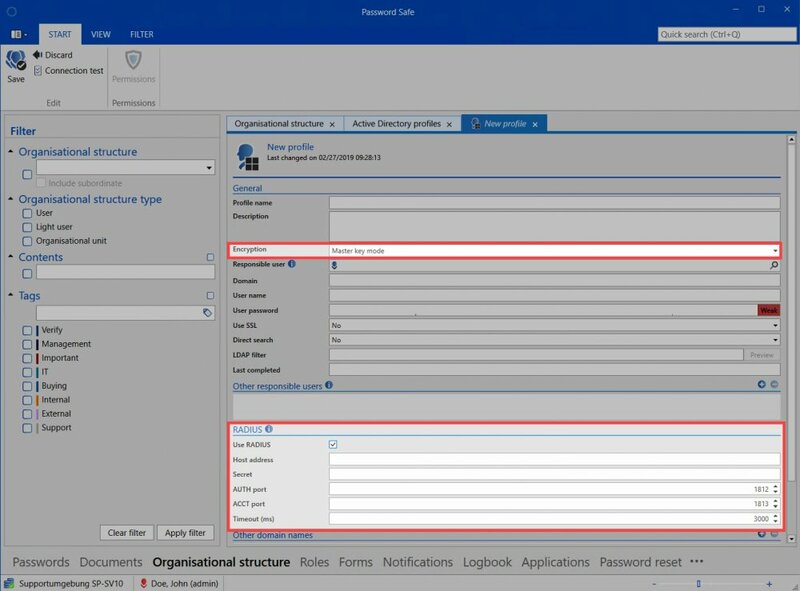 Access to the Password Safe AdminClient must be set up on the RADIUS server. A corresponding Secret must be configured for access. In Password Safe, users must have been imported from the AD in masterkey mode. Use RADIUS First; the usage is activated. Host Address The address of the RADIUS server is stored here. Secret Refers to the secret stored for the Password Safe AdminClient. AUTH Port The so-called AUTH port of the RADIUS server is specified here. ACT Port The ACCT port of the RADIUS server can also be stored; if required. Timeout The time the RADIUS server has to react; can also be configured.